But the concerns of Vancouverites were not a figment of their imagination. They were all too real. A wave of capital from abroad, primarily from China, was entering the Vancouver real estate market and driving prices skywards. 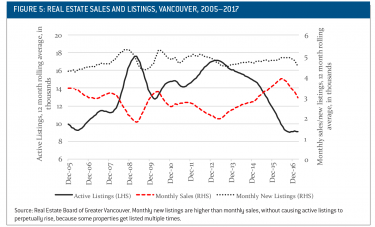 And so now Toronto has joined the housing bubble club, as Vancouver put up a flimsy shield only to see some of that foreign capital bounce off it and ricochet east – and toward Seattle and Victoria. Figure 5 is a modified version of figure 4 for the Greater Vancouver market, this time using a 12-month rolling average technique to smooth out seasonal fluctuations (and using monthly, not yearly, sales totals). 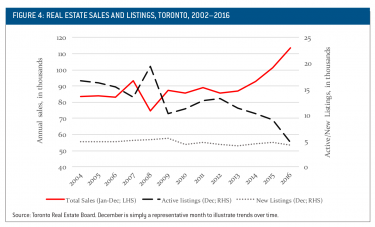 As in Toronto, the same surge in demand (dash line, right side) has drawn down inventory (solid line, left side) and created tight market conditions – which first drove prices up rapidly, and then stabilized prices as new listings began to fall in line with the sales decline in early 2017. While both the B.C. and Ontario governments are now collecting data on foreign buyers, they inevitably present a misleading picture. The existing efforts rely mainly on asking buyers whether or not they are foreign citizens. However, the issue in Toronto and Vancouver is about the source of the money for purchases, not citizenship. “Foreign ownership” is ownership primarily on the basis of foreign income or wealth. Citizenship can be a useful proxy for that, but it is incomplete. So far, politicians have not been willing to implement such a surtax.22 Incumbent governments are too tied to real estate industry donations, and their strategies of economic growth too dependent on the patently unfair policy framework of pampering foreign owners. 1 “CMHC President Warns Against Scapegoating Foreigners In Vancouver Housing Debate,” CBC News, November 30, 2016. 2 Josh Gordon, “Toronto, Don’t Let Vancouver’s Housing Crisis Become Yours,” Globe and Mail, September 1, 2016. 3 For this debunking, see for example my Vancouver’s Housing Affordability Crisis: Causes, Consequences and Solutions (Vancouver: Simon Fraser University, Centre for Public Policy Research, May 2, 2016) and In High Demand: Addressing the Demand Side of Toronto’s Housing Affordability Problem (Toronto: Ryerson City Building Institute, March 13, 2017). 4 See Frank Clayton and David Amborski, Countering Myths about Rising Ground-Related Housing Prices in the GTA: New Supply Really Matters (Toronto: Ryerson University, Centre for Urban Research and Land Development, April 25, 2017). It is weak, misleading scholarship – they do not even mention the concept of “supply elasticity” in a report on supply and housing prices. As this goes to press, Ontario government data have undercut one of the central claims of the supply side view: that there is a dearth of serviced land (“Thousands of Sites for Homes Sit Shovel-Ready in Toronto Area,” Globe and Mail, May 8, 2017). 6 There is no attempt to gratuitously single out China here. Similar concerns and analysis would be happening if the money arrived from any other society. The reference to a specific country is required because our governments haven’t collected good data, which would allow aggregated foreign ownership statistics to tell the story. 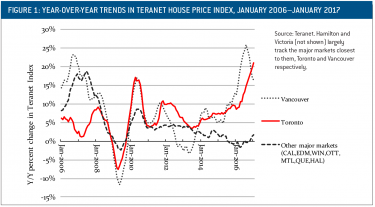 7 See, for example, the Hurun Report, available here; my Vancouver’s Housing Affordability Crisis; and “Chinese Home Buyers Turn Their Attention Away from Vancouver,” Globe and Mail, March 7, 2017, respectively. 8 For background, and data, on this capital flight, see for example “Chinese Start to Lose Confidence in Their Economy,” New York Times, February 13, 2016; Matthew Klein, “Chinese Capital Flight is Back,” FT Alphaville, January 18, 2017; and Orville Schell, “Crackdown in China: Worse and Worse,” New York Review of Books, April 21, 2016. 9 “Seizures of Undeclared Cash Spike at Vancouver International Airport,” Globe and Mail, September 9, 2016. 10 See Chart 9 in TD Economics, “Toronto Housing: The Heat Is On, Buyers Caught Up in the Action,” March 20, 2017, retrieved here. 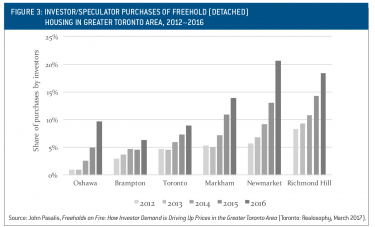 11 John Pasalis, Freeholds on Fire: How Investor Demand is Driving Up Prices in the Greater Toronto Area (Toronto: Realosophy, March 2017), retrieved here. 12 See my In High Demand. 13 Sales for the early months in 2016 were still above sales totals for the same months in 2015, itself a very hot market. They only dipped below the 2015 figures in July, the same month the tax was announced. Those wanting to downplay the impact of the tax with talk of “the market was cooling before the tax” are therefore overselling it a bit – June 2016 was still the hottest June in terms of sales since 2005! 14 For one illuminating example, see Kathy Tomlinson, “Out of the Shadows,” Globe and Mail, September 13, 2016. 15 Consider the consistent estimates that around 60 to 70 per cent of the high-end Westside Vancouver market is foreign money, but that in the B.C. government data “foreign” buyers are only 10 per cent of City of Vancouver sales, and their average purchase price is lower than that of “domestic” buyers. 16 This estimate was given during a talk to the Global Risk Institute in Toronto. 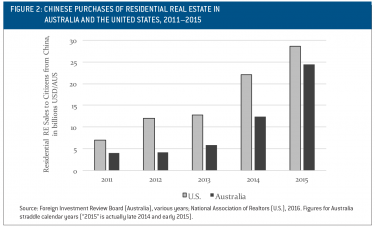 See also David Ley, “Global China and the Making of Vancouver’s Residential Property Market,” International Journal of Housing Policy, Vol. 17, No. 1 (2017), pp. 15–34. 17 Richard Wozny, Low Incomes and High House Prices in Metro Vancouver (Vancouver: Site Economics, April 2017). 18 Josh Gordon, “The Ethical Case for Taxing Foreign Home Buyers,” Globe and Mail, April 12, 2017. 19 See Josh Gordon and Rhys Kesselman, “Face It, There’s Nothing ‘Free Market’ about the Vancouver, Toronto Housing Booms,” National Post, April 13, 2016. 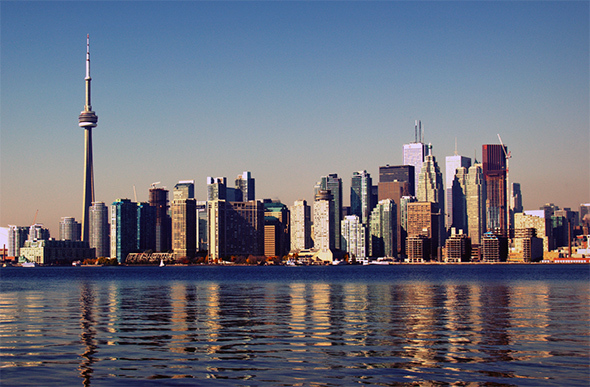 20 Ontario’s much-hyped “nonresident speculation tax,” while often compared to B.C.’s foreign buyer tax, is no such thing: its loopholes are so big that one can only conclude that it was designed to fail. 22 The B.C. NDP, to its credit, has endorsed a variant of this surtax idea. 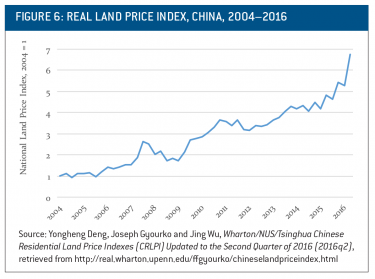 23 For some of the above, see Jing Wu, Joseph Gyourko and Yongheng Deng “Evaluating Conditions in Major Chinese Housing Markets,” Regional Science and Urban Economics, Vol. 42, No. 2 (2012), pp. 531–545, and Dexter Roberts, “The Controversial Chinese Economist Uncovering Tough Truths,” Bloomberg, March 23, 2017.